The UK’s most comprehensive festival dedicated to programming contemporary independent South Asian cinema, the London Indian Film Festival, returns for its ninth edition and the fourth festival running that we are excited to support as title sponsor. Here we share three highlights from the forthcoming Festival. 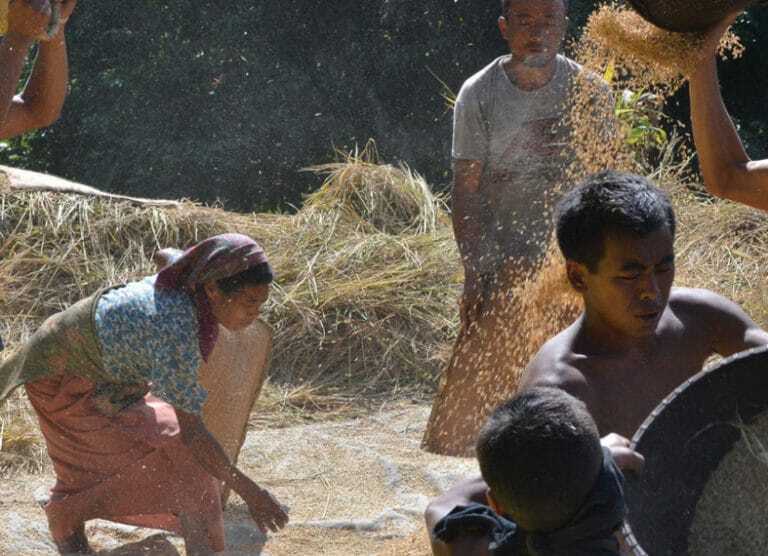 As they work in cooperative groups — preparing the terraced fields, planting saplings, or harvesting the grain and carrying it up impossibly steep slopes — the rice cultivators of Phek sing. The seasons change, and so does the music, transforming the mundane into the hypnotic. The love that they sing of is also a metaphor for the need for the other – the friend, the family, the community, to build a polyphony of voices. Up down and sideways is a musical portrait of a community of rice cultivators and their memories of love and loss, created from working together on the fields. What better a time than now to continue conversations about the impacts of British colonialism? What better a medium than the documentary film to bring into question our understanding of representation, to reexamine the narratives made predominant by the media, to listen to different voices and, in doing so, to present new perspectives on this shocking subject matter? Here is a vital article about the film. And here is a Guardian article on British misconceptions about empire. The London School of Economics screening will be followed by a discussion with Professors Amartya Sen & Tirthankar Roy. Nisha’s double life — obedient to her traditional Pakistani upbringing at home, typical Norwegian teenager to her friends — comes crashing down when her concerned parents kidnap her and send her to Pakistan, in Iram Haq’s empathetic story of family, community, and culture. In summary – a musical portrait from Northeast India, a documentary on Bengal, and an intimate fiction in both Norway and Pakistan. And all the films have female directors or co-directors! Excellent and culturally diverse programming from LIFF this year! The festival runs from the 21-29 June in 11 cinemas across London, presenting 21 different films as well as a programme of shorts. See the full programme and book tickets here.